Bungie was supposed to have a livestream for Curse of Osiris yesterday Tuesday, 29 but instead, Bungie canceled that an gave us a blog post that responds to the growing concerns of the community towards Bungie. For most of the community, they are getting feed up with Destiny 2 going firstly on the XP system jumping from 160,000 XP needed to earn a Bright engram from its original 80,000 XP which would change depending on how fast or slow you gain said XP. Bungie’s blog post ‘The State of Destiny 2’ covered a variety of topics from things coming next week to the general quality of life improvements the studio aims to make at the beginning of the New Year. One of the significant components Bungie will be implementing are vendors and their inventory. Starting December 5, Armor Ornaments will be added to some existing armor sets for more visual customization without losing the players Shaders or Mods, and these ornaments will be unlocked by completing objectives specific to each set, and are permanently unlocked account-wide, just like Exotic Weapon ornaments. Also, they will be applied to the base pieces that you may already have collected, and can now unlock on Vendors. Season 2 will include these ornaments: Vanguard Faction Armor, Crucible Faction Armor, Trials of the Nine Armor, Iron Banner Armor, Dead Orbit Armor, Future War Cult Armor, New Monarchy Armor, and Eater of Worlds Raid Lair Armor. Banshee also has some updates on the weapons and Armor Mods, for players wanting to clear some Mod inventory space, Rare quality Mods will dismantle into Gunsmith Materials and have a chance to produce Legendary quality Mod Components. 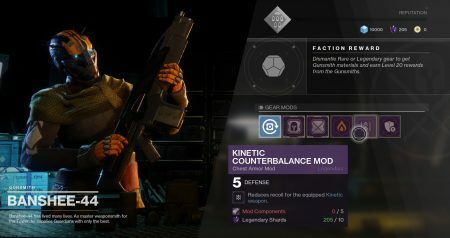 While players are chasing specific Legendary Mods (including Legendary Kinetic Mods), Banshee will offer a selection of specific Legendary Mods for direct purchase, with a collection that will rotate daily and cost Legendary Shards and Mod Components. A week later, Dec. 12, Bungie will be adding a new system to their weapons called Masterworks. With Masterworks the player can track and display the number of kills either from their total count or Crucible-only count (the player has that choice) with their weapons, much like the Tracker Ghost.  The player can also generate orbs for themselves and their allies on multi-kills and can add weapon stat bonuses that are selected randomly from a small pool which are re-rollable, something only seen in the original Destiny. How do you get these weapons though? Well, legendary weapons will drop as Masterworks versions, or they can be upgraded to become Masterworks versions but only if your power is above 250. 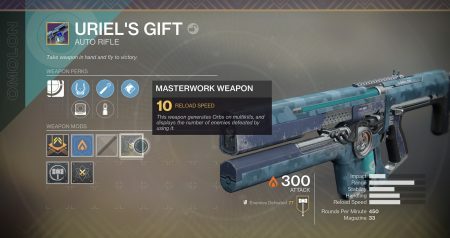 For a higher chance to obtain these weapons playing the Raid and Trials of the Nine would give the player the best bet, but if they, for some reason, decide they no longer want a Masterworks weapon, unwanted Masterworks can be dismantled into materials that can upgrade an existing Legendary Weapon into a Masterwork. Faction Armor and weapons will be unlocked for purchase using Legendary Shards and Faction Tokens on most Faction Vendors while all five armor slots will always be present, and Weapons will rotate weekly on Factions that have them. These slots will be unlocked by claiming Reward Engrams from the respective Faction and most importantly, the player will get credit for engrams you may have already claimed since launch. Which leads me to the next great news! 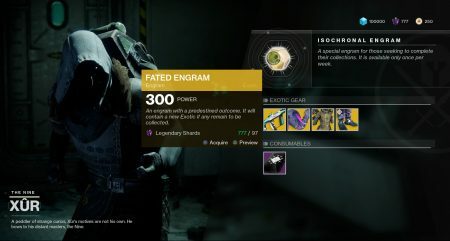 Every week, the player will be able to acquire one of the new Fated Engrams form Xur using Legendary Shards that will decrypt as Exotics that aren’t already in your collection. The price as of now is 97 Legendary Shards and that might change when the DLC releases but Bungie did mention that they realize that players are caring around a significant amount of Legendary Shards with nothing to spend them on. Xur is one of the ways they plan on changing that. Furthermore, a simpler Three of Coins will be coming back to Destiny which boosts Exotic drop rates from any source for 4 hours. There are no obscure stacking mechanics, and the player does not need to re-apply the Three of Coins before every boss. These will cost Legendary Shards, and the player can have as many as they like. With the Curse of Osiris coming very soon and the anger that the community feels now toward Bungies livestream, the content in Destiny 2, XP, and the news going around about loot boxes Bungie, I think, is realizing their mistakes. They have been more than open and so far on the player’s side. Let me know what you think of Bungie, or what’s happening in the current uneasy world of gaming @Dylanslegos — for everything on Destiny 2 and more stay tuned at BrutalGamer.com and for more information about Bungie’s ‘The State of Destiny 2‘.